Narconon Arrowhead is by the Oklahoma Department of Mental Health and Substance Abuse Services to deliver non medical detoxification services. 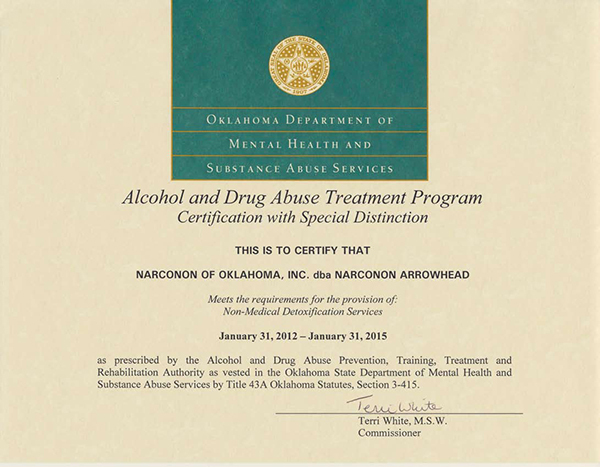 In addition to ODMHSAS certification, Narconon Arrowhead’s drug and alcohol rehabilitation program is accredited by the nationally recognized and prestigious Rehabilitation Accreditation Commission (CARF) since the center was first licensed in Oklahoma in 1991. 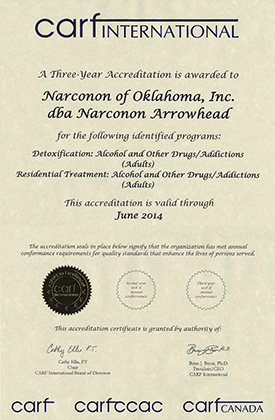 Narconon Arrowhead has been accredited by CARF for several years. CARF is recognized worldwide in the treatment community, whether you are trying to treat substance abuse or get physical therapy.